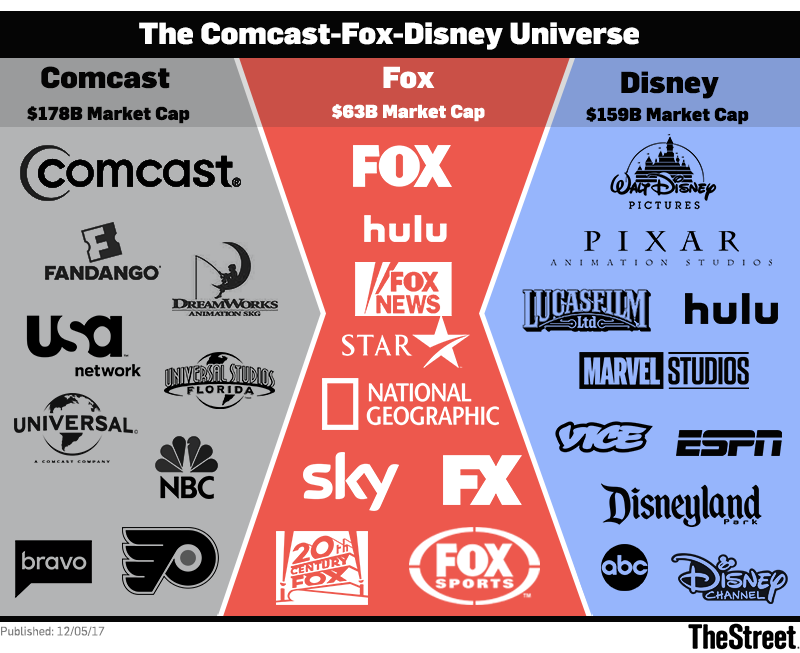 The House of Mouse could unveil a $40 billion deal with Fox as early as Thursday after Comcast dropped out of the race for Rupert Murdoch's key media assets. Walt Disney Co. (DIS - Get Report) shares were marked higher in pre-market trading Wednesday amid reports that the company is close to an agreement with 21st Century Fox (FOX that would see the Rupert Murdoch-led group sell some of its key media assets for around $40 billion. Disney took the inside lane for the Fox assets, which include its U.S. cable operations and its European pay-TV company Sky Plc (SKYAY , after rival Comcast Corp. (CMCSA - Get Report) dropped out of the bidding earlier this week. Multiple media outlets are reporting that Disney and Fox will announce specifics of the deal Thursday. Disney shares traded 1.28% higher than their Tuesday close in pre-market dealing, suggesting an opening price of $108.81, a move that would extend their three-month gain to just under 11%. Fox shares were indicated 2.26% higher at $34.36 each, valuing the entire group at just over $63 billion. Comcast shares were also trading modestly higher in pre-market dealing, and could extend their week-to-date gain to around 4.2% at the opening bell after the country's biggest cable operator said that "when a set of assets like Fox's becomes available, it is our responsibility to evaluate if there is a strategic fit that could benefit our company and our shareholders." "That is what we tried to do and we are no longer engaged in the review of those assets. We never got the level of engagement needed to make a definitive offer," Comcast said. TheStreet's Chris Nolter wrote Tuesday that a final deal with Fox could "clean up a few issues for Disney" while founder Jim Cramer told his Mad Money audience it could be a game-changer that moves the narrative away from cord cutting and ESPN subscriber losses. "Even though Disney bought X-Men and Fantastic Four parent Marvel Entertainment Inc. in 2009 for $4.3 billion, Fox has had the film rights to the franchises because of a pre-existing deal. Disney would own rights to the popular series," Nolter said. "Taking control of Fox's Avatar would resolve another anomaly in Disney's intellectual property marketing machine. Disney has an Avatar attraction in its Florida theme park. Buying Fox's Avatar would give it ownership of the IP behind it." TheStreet's technical expert, Bruce Kamich, offers a slightly different perspective, suggesting Tuesday that a move for FOX shares above the $34.61 mark "will be a fresh upside breakout and a decline to $31.96 would weaken the chart picture."